on patrols or in the Maricourt / Vaux trenches. The records for illness or wounds are very limited. Arthur Bell’s III Platoon all survived the period; although it is anticipated some men will have been wounded, other than Ernest Kemmery being shot in the leg during March 1916. Others will have undoubtedly suffered illnesses prevailing from the cold, wet and dirty conditions of the front. 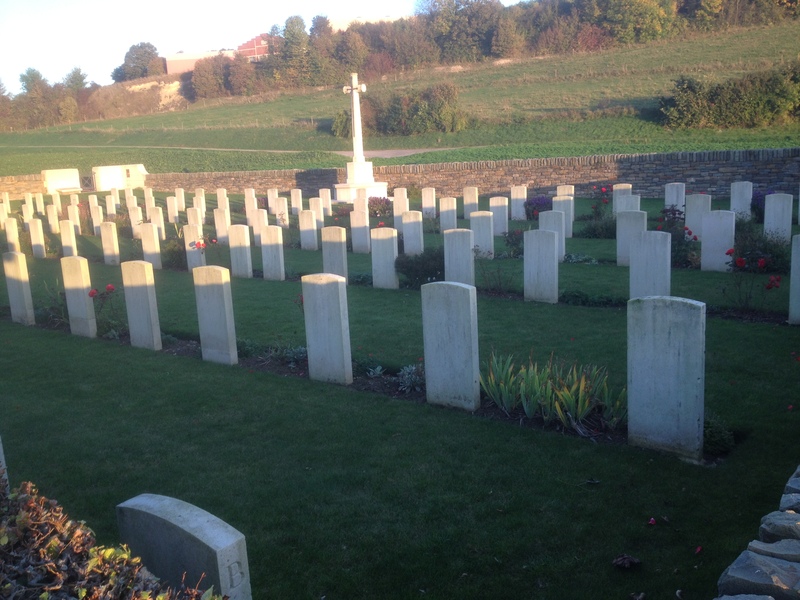 The majority of these casualties are buried in the Suzanne Communal Cemetery Extension. Rev. Balleine is reported to have administered some of the Brigade funerals. Fortunately, none of Arthur Bell’s III Platoon men are recorded as part of these losses. Lieutenant Nash’s Diary recorded that the dead men were sewn into blankets – paid from the man’s arrears of pay. “This shameful practice was afterwards stopped.” The 16th Manchesters Sergeant Bert Payne recounted a funeral duty soon after his arrival in Suzanne where a firing party shot blank cartridges over the twelve graves. 10th – Billets Domquer – All Ranks Strength 1026. 8th – Sailly Laurette – Officer Strength 29. Other Ranks 985. Total 1014. 11th – Shelled by the enemy. Casualties 1 Killed, 5 wounded. 6 mules Killed. 8638 Pt John Pownall Holt trained with IX Pln, C Coy and ,may have been transferred to A Company when he was killed, aged 27. He is buried in Suzanne. John had been born in Heywood and enlisted in Manchester on 3rd September 1914, having been a shipping clerk with Manchester Ship Canal Company. He was resident with his mother Frances Ann at 34 College Road, Whalley Range. 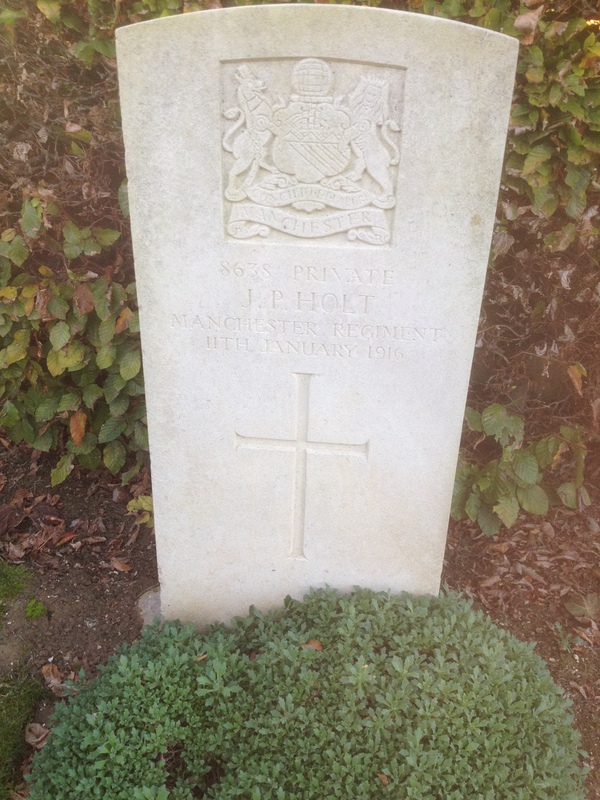 His brother 8637 James Holt was a bank clerk and trained in the same Platoon. James was wounded by shrapnel in late January (below) and killed in action on 1st July 1916. Younger brother 20795 Benjamin Holt was killed on the same day serving with 22nd Battalion. James and Benjamin have no known resting place and are commemorated at Thiepval. Pte 8369 Edward Rose Ashworth was one of the wounded on this day and treated in the Field. 12th – 2nd Lt William Tonge – See Maricourt Defences. A draft of men from 25th Battalion would be joining the Battalion on 20th February from 25th Battalion. They had arrived in France on 25th December 1915 and attached to 2nd Entrenching Battalion in Belgium on 7th January. 9001 Harold Westall was wounded in the leg by a German Bomb on 12th January and evacuated Home. Harold was Discharged and didn’t every join 17th Battalion in the Field. 14th – Forner Manchester Grammar School boy Sydney Cohen wounded. It is likely this report relates to 6594 Sydney Cohen of 16th Bttn. The War Diary makes no mention of wounded men on this day. 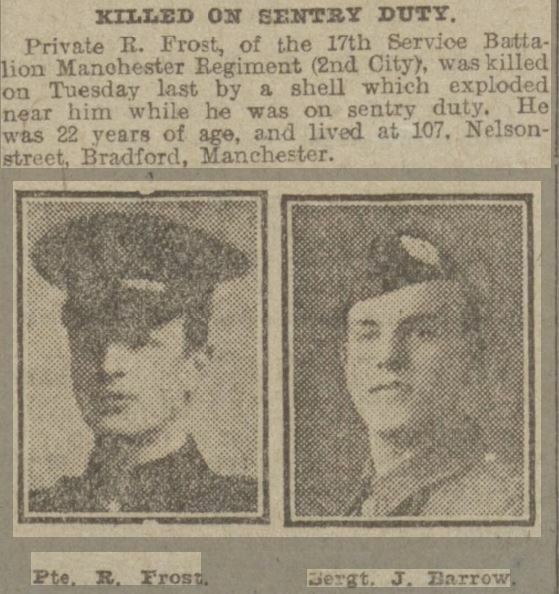 MEN reported Ptes 8077 C Castledine, 8577 G W Godfrey, 8559 George Ewart Goodbrand (Oldham Rd, MIles Platting) & 8944 H Wilkinson (Holyrood, Heaton Park) on Wounded List with L/Cpl 8637 J Holt of College Road, Whalley Range. 8199 J R Johnstone was on the same List as Shelld Shock. 20th – 1 O.R. Killed – 9110 Pt William Ashworth, aged 25. Husband of Alice Ashworth, of Union Institution, Jericho, Bury, Lancs. William was originally buried in Maricourt Military Cemetery, close to the cross-roads of the Albert-Peronne Road and Longueval Road. His remains were exhumed and relocated to the CERISY-GAILLY MILITARY CEMETERY in 1925. He trained with XI Pln, C Coy. The Register shows Williams Effects were passed to his widow and confirms his death in Maricourt. 23rd – 1 O.R. Wounded. 25th – 1 O.R. Wounded. 28th – Capt. Lloyd Wounded in morning. 2 O.R. Killed. 6 O.R. Wounded including 8559 George Ewart Goodbrand (Oldham Rd, MIles Platting), who has a GSW to hip. George was later transferred to the Labour Corps. Killed 8050 John Cecil Atkinson & 8432 Pt George Herbert Bagshawe. 8445 Pt Richard Bradshaw died of Wounds. Yorkshireman John Atkinson’s father, Arthur provided the epitaph for his grave “Blessed are the pure at heart”. Arthur received his sons effects and the Register confirms John was killed in action in Suzanne. MEN 14/2/1916 records his address as Spencer Place, Leeds. George Herbert Bagshaw’s epitaph was provided by his mother Martha “Many waters cannot quench love. Neither can the flood drown it.” Known in the family as Herbert, he had been born & resident in Miles Platting and employed as a warehouseman when he enlisted on 3rd September 1914. He had been hospitilised for 4 days in January 1915 at Heaton Park with tonsillitis. The Press Report indicates Herbert has been asleep in his billett when he was killed. Martha Bagshaw wrote a book concerning the help she gave to wounded Canadian troops. Maple Leaves in England is dedicated to the 17th Battalion and provides a sad, but positive insight on grieving families. Herbert’s father, George received his effects. MEN of 14/2/1916 records the family address as Albion Street, Miles Platting. month on 11th January during the German bombardment of Suzanne. Mary Ann received his effects and a widows pension of 20/6. Richard had a clean disciplinary record other than 7 days C.B. awarded for overstaying his leave pass on 18th October 1915. This was probably the last occasion he saw his wife and daughters. It is not known when 9251 Albert Meakins and J A Neil were wounded. Albert went on to serve as 51258 in the Somerset Light Infantry and then 450298 in the Labour Corps before he was transferred Fit to Reserve in 1919. He was first posted to E Company, suggesting he had enlisted in early 1915. Albert then trained with XIV Platoon of D Company. 8776 Joseph Arthur Neil was born 21/3/1895 in Failsworth and enlisted on 3rd September 1914. He had been 19 years old and employed as a warehouseman. In 1911, Joseph had lived with his parents in Coronation Street, Salford. He trained in X Platoon of C Company. 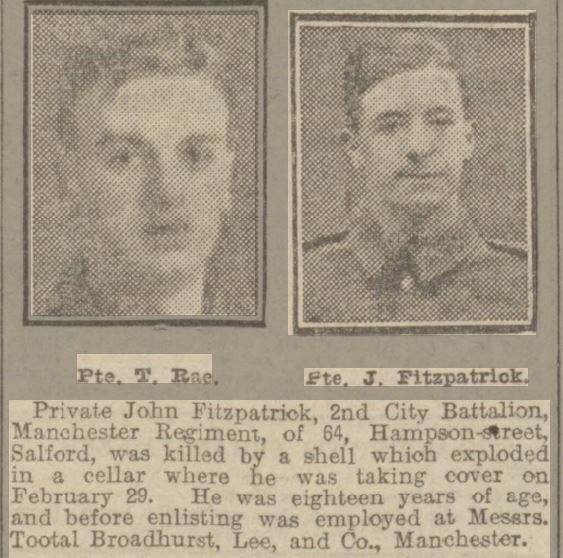 Following recovery, Joseph returned to the Manchesters (possibly renumbered 29684) and was Mentioned in Despatches on 25th May 1917 as part of 17th Battalion group. He was later transferred to the Labour Corps 444174. Joseph was also wounded in the left forearm 1918 and still suffering effects when he was discharged Class II in April 1919. His brother George Campbell Neil served as an NCO in the 18th Battalion, enlisting 5/9/1914 and discharged as Lance Sergeant, with SWB due to sickness, on 12/6/1916. 2nd – A3. 2 O.R. Wounded. 8538 Private Henry Eckersall Died of Wounds received while cleaning his rifle on 1st February, in Chipilly Field Ambulance aged 27. See A tragic accident Henry had been born in Heaton Park and employed as a clerk when he enlisted on 3rd September 1914. He was he son of Thomas and Annie Eckersall of Fylde Street, Gt Leven. Bolton and trained with VII Platoon of B Company. Henry’s Service Record includes the Court of Enquiry report relating to his wounding by accidentally shooting himself with his own rifle on 1st February. Witnesses were 8148 Private R. Goodier and 8427 Private W. Bottomley, both from VII Platoon. 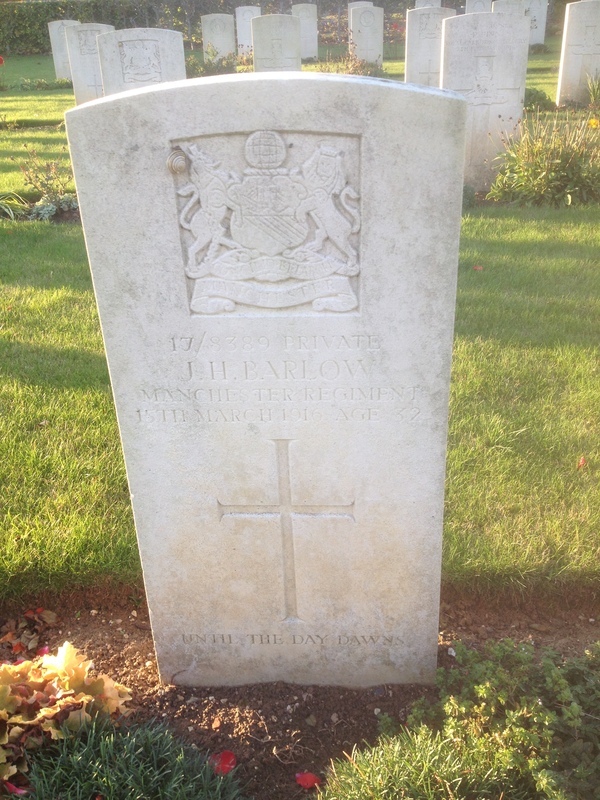 Lance Corporal Lowe (Possibly 8709 L/Cpl H Lowe of VIII Pln) attended his wounds before stretcher bearers arrived. 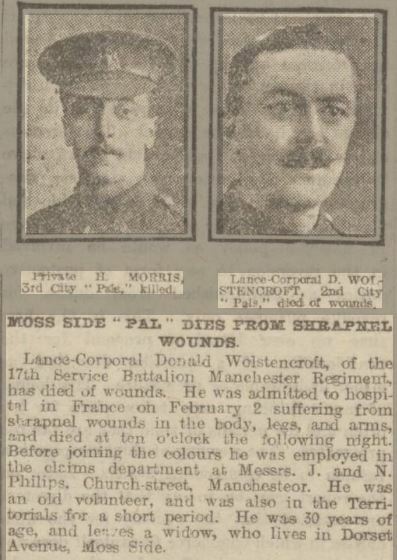 3rd – 8355 Lance Corporal Donald Wolstencroft, Died of Wounds in 21st Casualty Clearing Station in Hospital. He received multiple gun shot wounds in his right arm, back and both thighs the day before at Maricourt. Donald had trained with XVIII Platoon and was still serving with B Company when he died aged 31. His wife Mary Elizabeth provided the epitaph for his grave in Corbie “Not my will but thine O Lord” She then lived at 21 Hartington Street, Moss Side. The couple had married in St James Church Moss Side in August 1915. Donald had been a clerk at J & N Philips and previously served for 3 years with 2nd Volunteer Battalion, Manchester Regiment. He had enlisted on 2nd September 1914, appointed unpaid Lance Corporal on 19th September and paid in the rank on 2nd December. Mary had remarried a Mr Lewis when she received Donald’s medals in 1922. 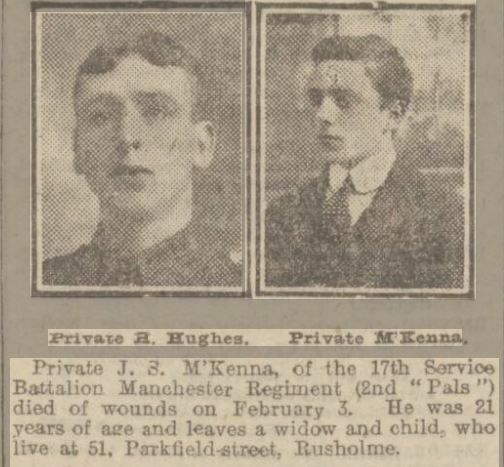 8228 Private John Seed Mckenna. Died of Wounds in Rouen Hospital. John was 21 and had trained with IV Platoon of A Company. His widow Dorothy Vene Taylor arranged an inscription on John’s grave confirming the couple had a child “From his loving wife and son”. At that time, Dorothy had remarried a Mr Taylor and was resident at 115 Mauldeth Road, Withington. 5th – A3. 1 O.R. Wounded. 6th – A3/Maricourt. 1 O.R. Wounded. 8th – Suzanne. 1 O.R. Wounded. 10th – Suzanne. 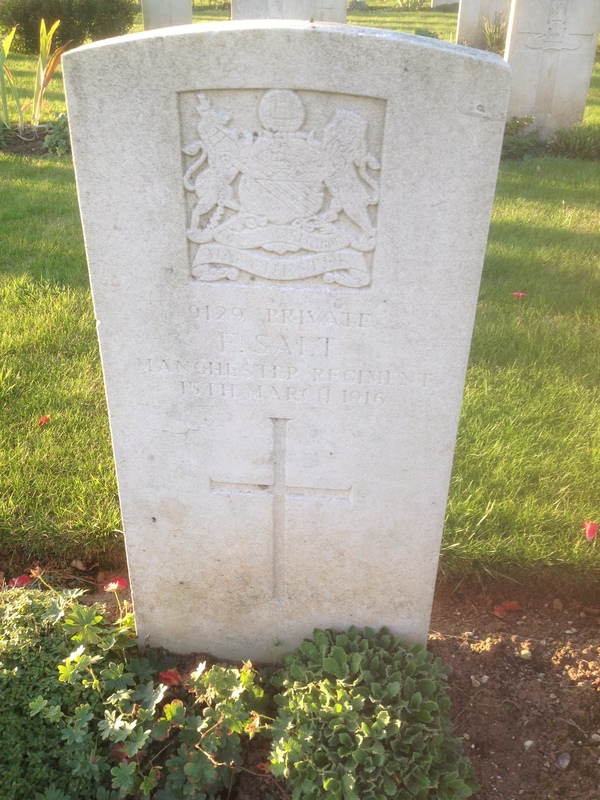 8301 Private Albert Smith – who trained with XVI Platoon of D Company – was killed. Albert had been born in Stalybridge and enlisted in Manchester. Lieutenant Q.M. 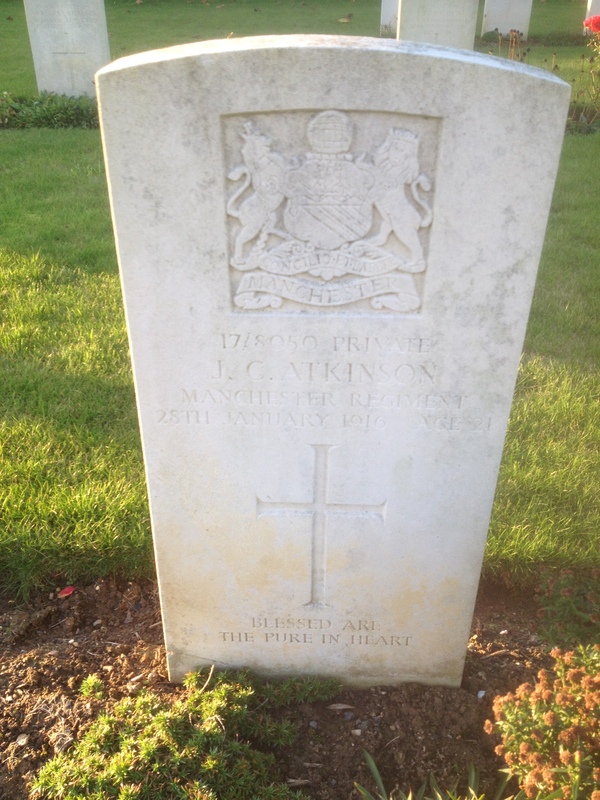 Yarwood, 2nd Lieutenant Alastair Gregory Cameron & 10 O.R. Wounded. Merchiston Old Boy Lt Cameron was evacuated to England, with wounds to his tibia and gas gangrene. He was treated on the Isle of Wight and later served in Catterick Garrison. Tom Yarwood returned to the Bttn and appointed Adjutant in Feb 1917. 11th – 8609 Private Harry Hollingsworth. Died of Wounds in Hospital at Corbie, having been treated in No.5 Casualty Clearing Station. Harry had trained with VII Platoon of B Company and his Medal Index Card suggests he arrived in France in 1916, after the main group’s date in November 1915. His widow, Sarah Jane received his effects. 12th – A3. 1 O.R. Wounded. 13th – A3. 1 O.R. Wounded. 18th – Suzanne. 1 O.R. Wounded. 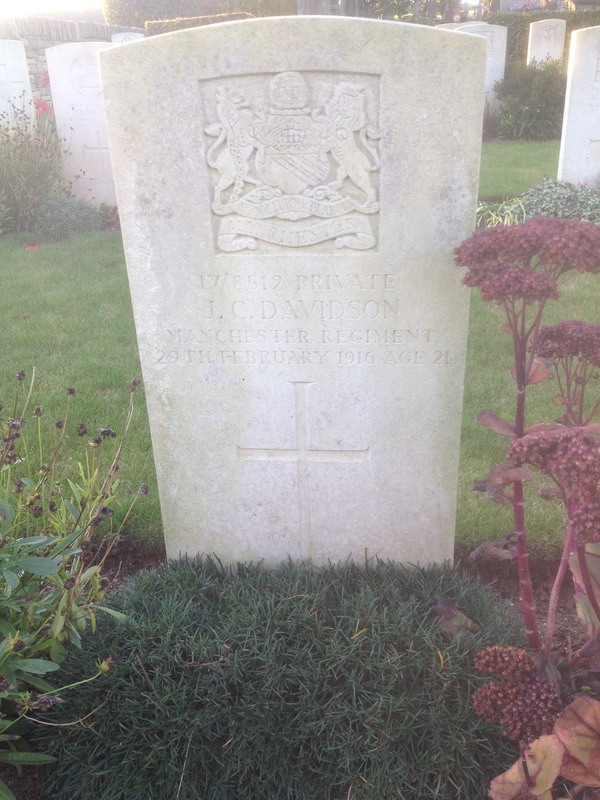 Pte 8428 Harold Bowden was admitted to Hospital in Rouen with a foot & ankle condition. He was subsequently evacuated Home and discharged unfit on 28/9/1916. 19th 9496 Private Thomas Ogden Died of Wounds in Hospital. He had enlisted on 2nd March 1915 and trained with XIX Platoon of E Company before transferring to D Company. 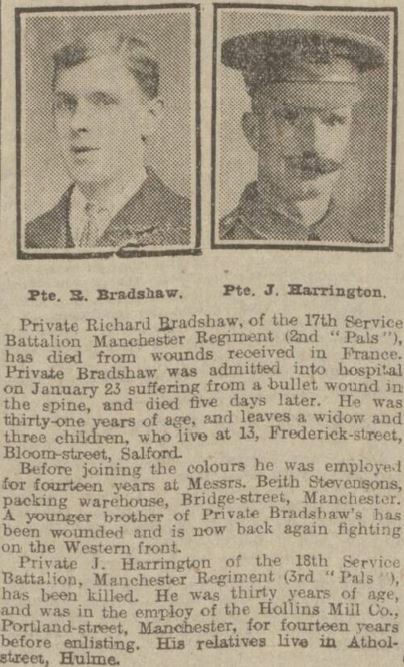 His two brothers, W John and Richard were also killed during hostilities serving with the E Lancs and Royal Irish Fusils. 29th – Suzanne. 10 O.R. Wounded. 3 Killed during shelling at 15 minute intervals. 8142 Private John Fitzpatrick, 8553 Private Richard Frost and 8512 Private John Charles Davidson are buried alongside each other in Suzanne Communal Cemetery Extension. 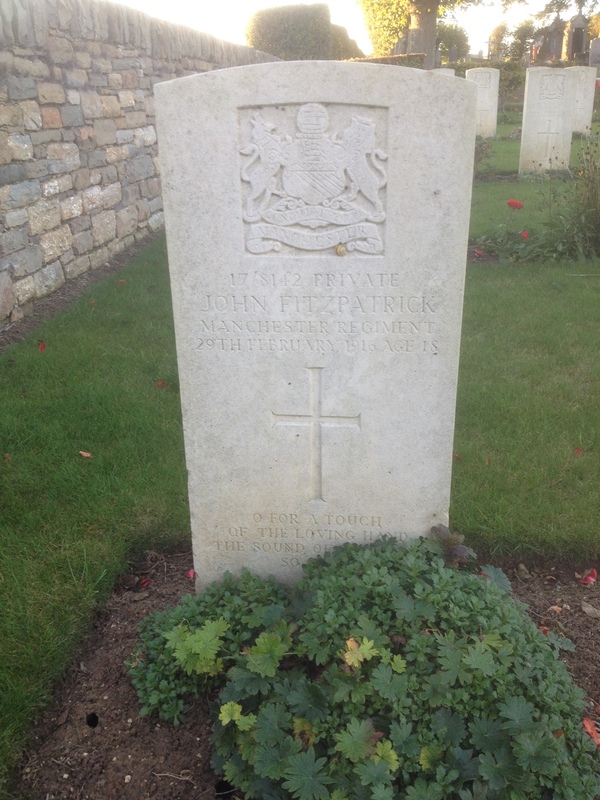 18 year old John Fitzpatrick from Salford was sheltering in a cellar when a German shell killed him. He had been employed by Tootal Broadhurst & Lee before the war and had trained with X Platoon of C Company. 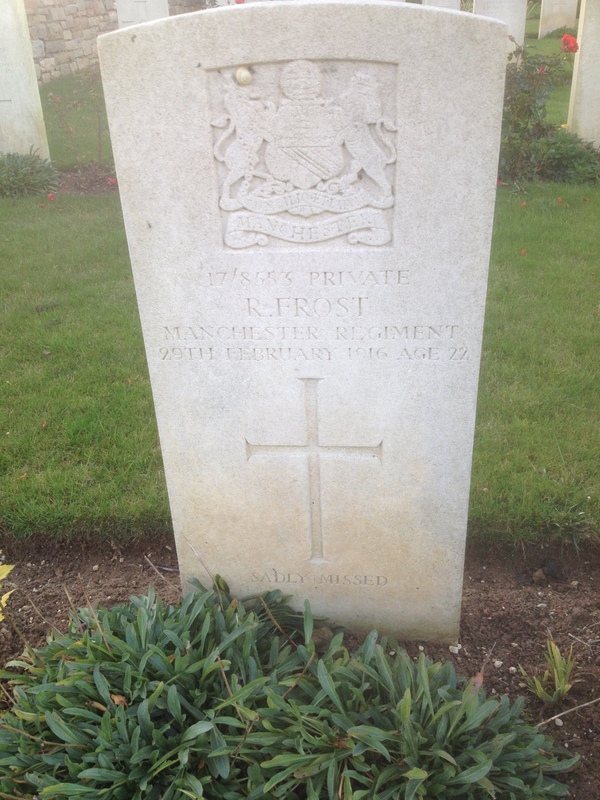 22 year old Richard Frost was a former cloth salesman from Bradford, Manchester. 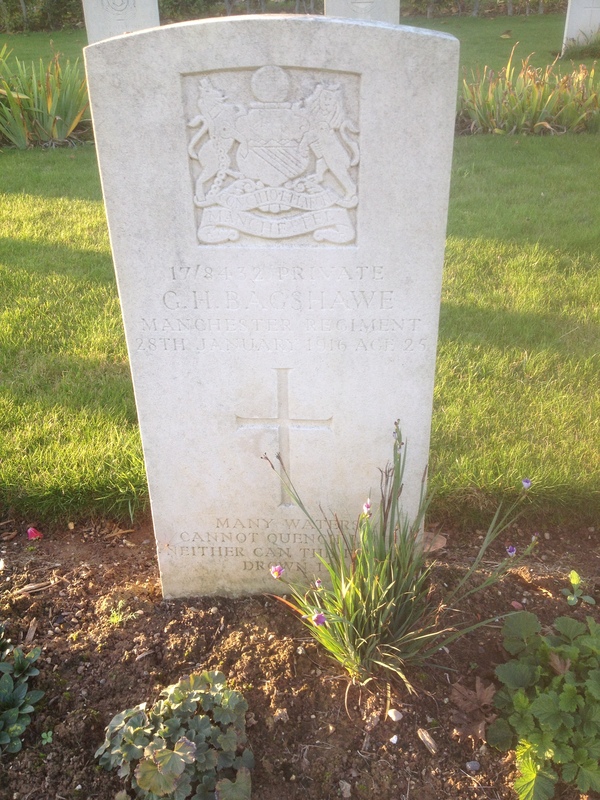 He had trained with V Platoon of B Company and was on sentry duty when he was killed in the bombardment. Battalion left for France, John had been posted to 25th Reserve Battalion until he left England. His next of kin is noted as his brother Fred, when John enlisted. Fred had also been killed when his sisters Agnes and Georgina received John’s medals. 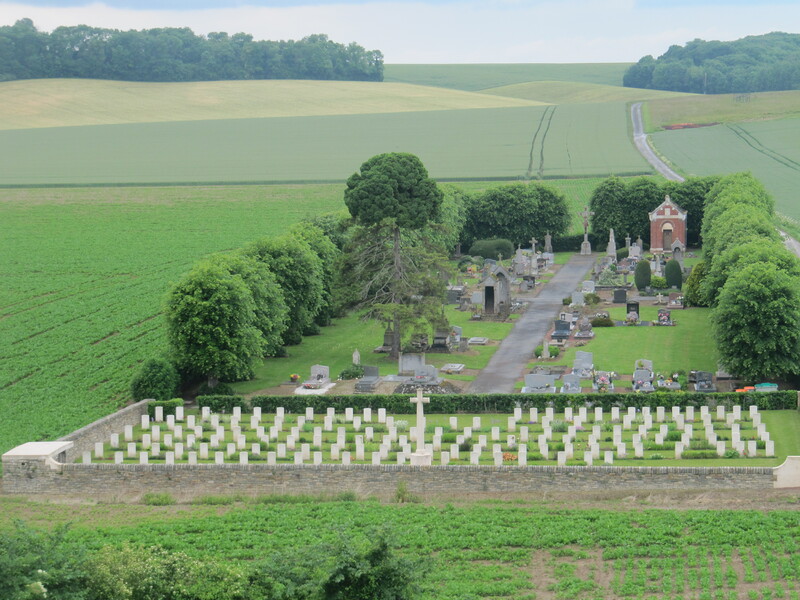 3rd – Y3 Sub-Sector Maricourt. 1 O.R. Killed (by sniper). 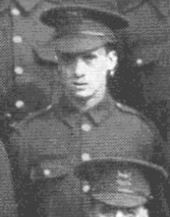 9122 Private Joseph Kirwan was killed on 3rd March, aged 24. Joseph had trained with X Platoon of C Company which is noted as defending fire trenches 16 & 17. Originally buried in Maricourt Military Cemetery. His remains were relocated to CERISY-GAILLY MILITARY CEMETERY in 1925. Brother of Mrs. Annie Sheerin, of 9, Collier’s Avenue, Ranelagh, Dublin. Born at Balbriggan. Percy Ramsden received ankle and leg injuries on 5th March. He was also a member of X Platoon. 6th – Relieved by 16th Manchesters. Strength 30 Officers & 978 Other Ranks. Total 1,008. He has no known resting place, being commemorated at Thiepval. Robert had been an Associate of the Royal Institution of British Architects, working alongside Sergeant Percy Amos of III Platoon with Co-Op in Balloon Street. Their names are alongside each other on the Manchester Technical College Memorial. 11th – Relieved by 16th Manchesters. Strength 28 Officers & 966 Other Ranks. Total 994. 12th – 2nd Lieuts Ilett J.J., Herbert Haslam , Robert M Calvert and Richard.W.L. Wain joined the Battalion. 21 year old 8209 Charles Kerr Died of Bronchitis and possible pneumonia in the care of British Nurses in Hospital at Etratat. The kiss before dying: Nurse’s poignant farewell to First World War soldier. Nursing Sister Edith Appleton noted Charles had been in their care for 15 days when he died. The War Diary makes no mention of men being hospitilised or withdrawn from the front due to illness. Charles had trained with I Platoon of A Company. He had been a Clerk with Morreau, Spiegleberg & Co prior to enlisting. 8156 G Hawkins, 8821 F G Robinson & 8866 G W Smith also joined A Company (IV Platoon) from the same firm. Drummer H. Midwinter had also enlisted and trained with the 17th Bugle Band. Private 10337 Rowland Atkinson was admitted to 22nd Fd Ambuland on 12th March with a chest condition. He was diagnosed with pneumonia and transferred to 96th Fd Ambulance. 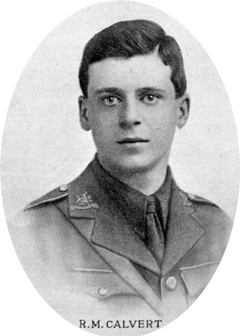 Rowland returned to the Battalion and was killed in action on 1st July 1916. Prior to hostilities Rowland had been a cardboard box cutter, resident Chorlton on Medlock. He had been rejected from 7th Bttn on medical grounds before enlisting in 18th Bttn on 4th September and transferring to 17th Bttn on 16th October 1914. 14th (Suzanne) – Starting at 6pm the village was shelled at intervals of about 20 minutes. The shells fell chiefly round Chateau + in Centre. Casualties 3 O.R. Killed. 1 O.R. wounded since died. 9 O.R. wounded. 8389 James Henry Barlow, 9129 Fred Salt and 31257 Austin Gibbons were the three men killed. They are buried next to each other in Suzanne. Austin Gibbons had originally enlisted 11307 in 18th Battalion, before joining the 17th Battalion on the 2nd of January. Salford born James Barlow had trained with IV Platoon of A Company. James was an iron founders labourer in 1911 and lived with his mother, Margaret and father Horatio, who was a music hall artist He was the older brother 8374 L/Cpl Arthur Barlow (Promoted unpaid January 1915); who trained with I Platoon with his older brother brother 8375 Charles Frederick. The brothers survived hostilities, although Arthur was severely wounded in the right foot at Montauban and discharged back to his wife Eleanor with a Silver War Badge in April 1917. It is thought all three brothers enlisted on 3rd September. The Register of effects suggests an Albert Barlow as another brother. Fred Salt was born and resident in Swinton when he enlisted on 9th December 1914. He had previously been employed as a tile dipper and trained with James Barlow in IV Platoon. Fred’s Record confirms he was killed by a shell in Suzanne 0n 15th March. Austin Gibbons had been employed as a dyer when he originally enlisted in the 18th Battalion on 19th June 1915. He was posted to the 25th Reserve Battalion on 30th August 1915 and 17th Battalion when he arrived in France on 6th January 1916. Austin’s Records also confirms his death in Suzanne on 15th March resulting from a shell. .26324 George Levison Cartlidge was the man to have died of wounds after the bombardment. George was the a cotton goods warehouseman when he enlisted and reident of Chorlton on Medlock. George’s Medal Index Card also implies that he arrived in France after 1915. George’s brother Vincent had been in the Territorial RAMC and continued service through hostilities. 17th – Y3 Sector 1 O.R. Wounded. The Service Record for Pte 9233 Arthur William Jenkinson shows he was wounded on 17th March. Arthur was treated in 96th Field Ambulance and returned to duty. 18th – Y 3 Sector 1 O.R. Wounded. Strength 33 Officers. 977 Other Ranks. Total 1,003. Relieved by Buffs and withdrawn from front. Harry Foden Suzanne Communal Cemetery Extension Private 17/8563, XV Pln “D” Coy, who died on 05 May 1916 Age 28. Son of John and Esther Foden, of 61. Grey More Lane, Bradford, Manchester. Lance Corporal Oscar Michael Hetherington of XV Pln and three Other Ranks were also wounded on 5th May. John Worthington Farrow Corbie Communal Cemetery Extension Serjeant 8138, who died on 05 May 1916 Age 22. Son of Edwin and Louisa E. A. Farrow, of Twyford, Hale, Altrincham, Cheshire. Educated at Epworth College, Rhyl, and afterwards in the employ of Richard Haworth & Co., Ltd., Manchester. Enlisted Sept., 1914. His brother Edwin Percy also fell. 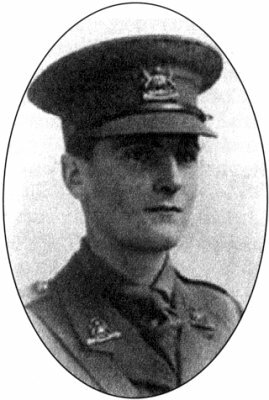 2/Lt Cyril Thornton Jensen was killed by shell fire, near Vaux, attached to “T” Howitzer Battery, or 90/1 Trench Mortar Battery, as specified in the War Diary. Cyril had enlisted in 28th London Regiment (Artists Rifles) in March 1915 and commissioned in 18th Bttn on 19/7/1815. He left a widow Winifred who remarried and lived in India. 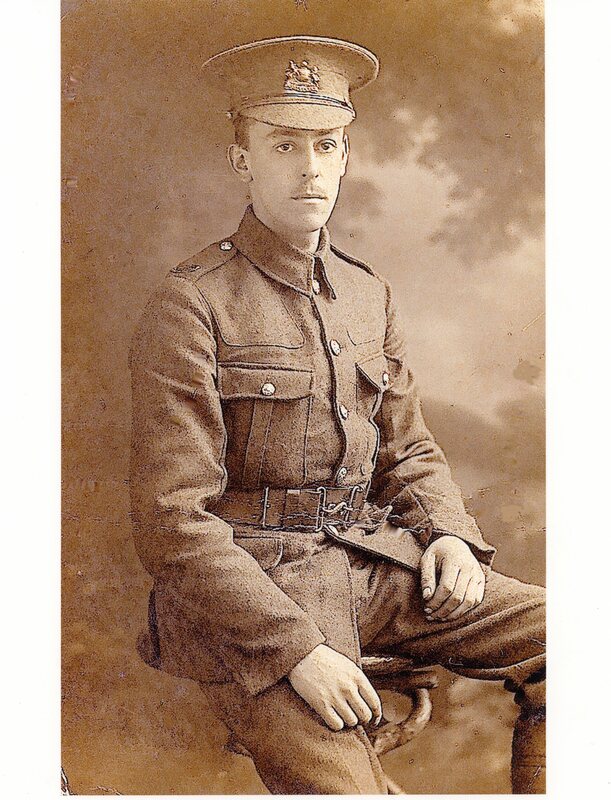 He had disembarked in France on 4/3/1916 posted to 25th Bttn and attached to 17th Bttn on 15th March. Cyril had been born on Trindad in the Caribbean on 4/9/1885. His parents were Carl and Stephanie Jensen. After spending part of his childhood in India, he joined Dulwich College in May 1897. After leaving school in 1900 Cyril worked for Eastern Telegraph Company. Cyril had been a clerk when he married Winifred in 1909. The couple lived in Sutton in 1914. Harry Copsey Suzanne Communal Cemetery Extension Private 17/8487, who died on 13 May 1916 Age 32. Husband of Annie Copsey, of 12, Crosscliffe St., Moss Side, Manchester. Harry had trained with IX Platoon of C Company. He had enlisted with a a large group of fellow employees from Barlow & Jones. C Company had taken over the line in Vaux Wood on 9th May and Harry was killed while sleeping in a dugout. 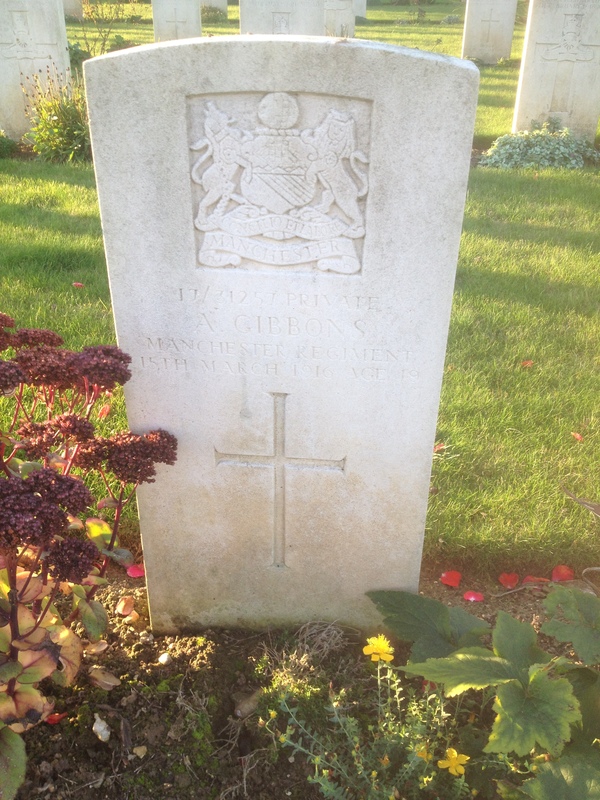 8236 Herbert Mercer was killed in action, aged 21 and is buried in Suzanne Communal Cemetery Extension. His parents, William and Rose Mercer received his effects. Herbert had been born and resident in Pendleton. Herbert had trained with Harry Copsey in IX Platoon and it is quite likely they were in the same dugout in Vaux Wood that received a direct hit from a German shell. Nine members of 18th Bttn were killed on the same day. 4 Other Ranks from 17th Bttn were also wounded on 13th May, with 2 further wounded the next day. Ernest Jones Corbie Communal Cemetery Extension Private 8681, who died on 15 May 1916 Age 25. Son of William and Jane Jones, of 4, Coleman Street, Ardwick, Manchester. Son of Frederick W. and Ellen Whatmough, of 9, St. Paul’s St., Stockport. On 20th June 8449 Paul Backhouse returned Home and was discharged due to sickness on 26/9/1916, resident 29 Wilmslow Road, Cheadle. Paul had been an insurance clerk before he enlisted on 3/9/1914. His house was named Maricourt when Paul died in June 1943.